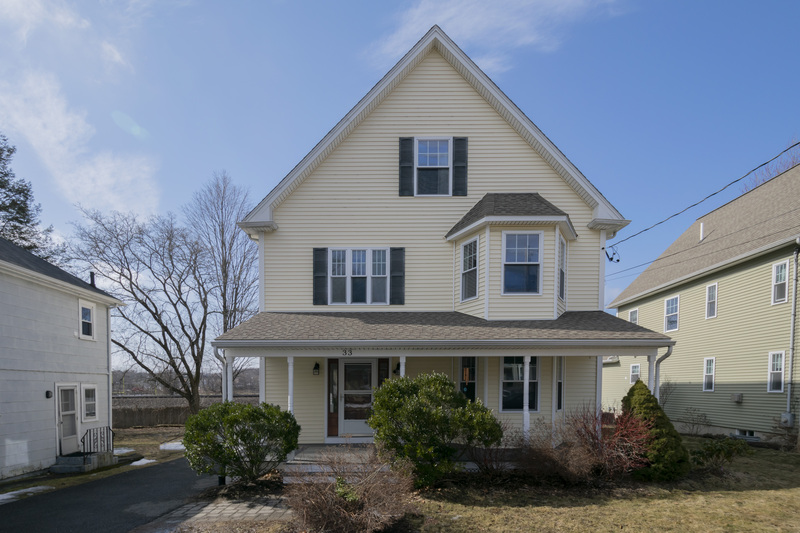 Modern style and curb appeal galore define this young, meticulously-maintained Colonial that has it all, perfectly situated within walking distance to Winchester High School, McCall Middle School, the commuter rail, and the many fine shopping and dining options in Winchester Center. Modern style and curb appeal galore define this young, meticulously-maintained Colonial that has it all, perfectly situated within walking distance to Winchester High School, McCall Middle School, the commuter rail, and the many fine shopping and dining options in Winchester Center. A charming farmer’s porch welcomes you into the front foyer where gleaming hardwood floors, crown molding, and an abundance of natural light flow throughout the home’s immaculate interior. A large cased opening draws you into the formal living room with crown molding and gleaming hardwood floors. A gas burning fireplace, with a stylish white mantel and surround, creates a focal point for this beautiful room as sunlight streams through the large bay window. The living room connects seamlessly with the open concept kitchen, perfect for comfortable living and effortless entertaining. Create culinary delights in the open plan kitchen guaranteed to inspire your inner chef with quartz countertops, stainless steel appliances, gas cooking, a large breakfast bar island, hardwood floors, stylish cabinetry, crown molding, a tile backsplash, recessed lighting and modern pendant lights. The kitchen transitions seamlessly into the dining room as the gleaming hardwood floors continue to span. Outdoor living is easy with a sliding glass door from the dining area connecting with the deck overlooking the fully-fenced backyard with a new playground area built-in 2018. An outdoor shed, added in 2014, offers the perfect place for storing your garden tools. Imagine summer days spent relaxing on the front farmer’s porch while watching the world pass by. The home continues to impress at every turn as the first level delivers the spacious and light-filled master suite. A cathedral ceiling gives an added feeling of expansiveness as shining hardwood floors and a ceiling fan offer comfort and style. The master bathroom is beautifully tiled with a modern white vanity, quartz countertop, and a spa tub with shower. A convenient laundry room is perfectly placed on the first level for ease in multi-tasking while managing family life. A half bathroom completes the first level. A staircase from the front foyer leads you to three spacious family bedrooms and two more full bathrooms to easily accommodate the whole family. The bedrooms are light-filled with hardwood floors, one with a gorgeous bay window, and offer large closets for ample storage. The bathrooms are tastefully done in subtle tones with modern finishes. Escape to your own private retreat in the finished third level offering a versatile space to use as a playroom, art studio, exercise space, or whatever you may desire. The huge, open plan space features gleaming hardwood floors and recessed lighting. A half-finished closet area offers potential as additional storage space or a future bathroom. The lower level has a semi-finished area which offers a great playroom, recreation space, and is ideal for rainy day activities. The lower level also offers abundant storage for ultimate organization. Central air conditioning helps keep the home comfortable during summer months. This meticulously maintained home offers a prime location within close walking distance to all the town center has to offer including shopping, dining, the library, public transportation, schools, and much more. Be a part of the highly-renowned Winchester public school system. This is the one you have been waiting for.